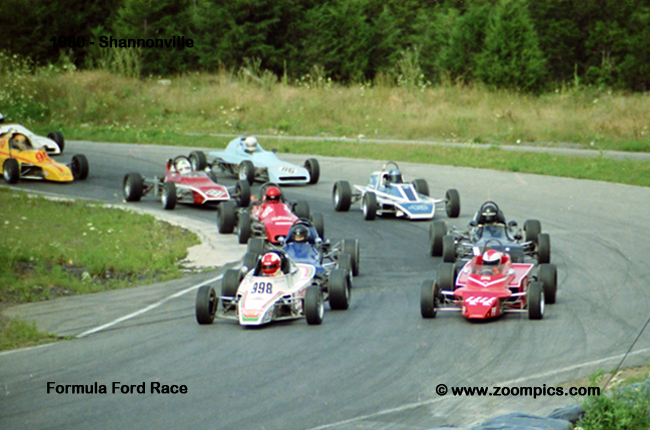 Below are images from Ontario and Quebec during the 1980 Canadian amateur sports car racing season. In Ontario, competitors raced at Mosport and Shannonville. There were ten-classes scoring points towards the Ontario Regional Championships - Formula Ford, Formula Vee, Formula Libre, Formula Four, GT1, GT2, GT3, Honda/BF Goodrich, C Sports Racing and Stock Production. There were nine race weekends in Quebec – five at Sanair, Deux-Montagne had two and one each at Montreal and Trois-Rivieres. Drivers in this region were competing for titles in the Honda/Goodrich, Formula Ford, GT2, GT3 and an Invitational class.